Today we’re going to take a break from G.I. Joes and Transformers and focus on a more delicious type of hero. This is Mr. Bacon. I received Mr. Bacon as a stocking stuffer this year from Vanessa..er…I mean Santa Clause. I believe Santa picked this up for me at The Freak Lunchbox, a novelty/candy store in downtown Halifax. It’s a really cool little store that is eternally busy. They have all kinds of retro and European candy, the kind of stuff you can’t pick up just anywhere. They also have a slew of novelty items like whoopee cushions, fake mustaches and bobble heads. I’ve considered buying toys there on a few impulsive occasions but the price usually deters me. Retro tin robots do not come cheap at hipster candy stores. One toy I almost picked up on a visit there not long ago was Mr. Bacon. 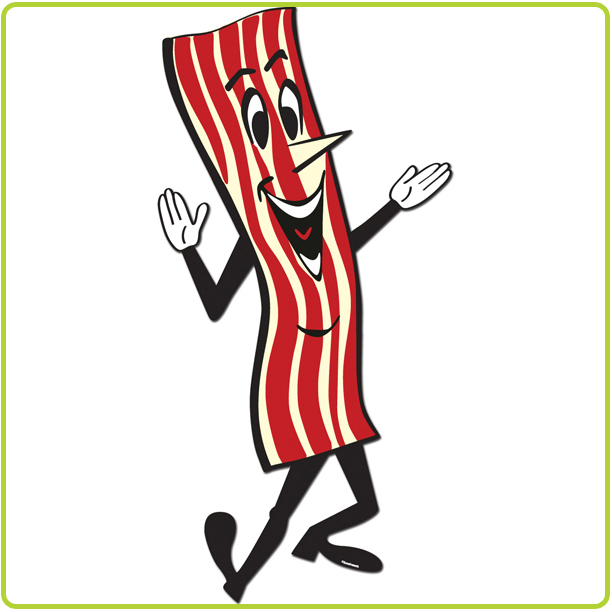 He’s bacon, he’s an action figure…what’s not to like? He wasn’t even that expensive but common sense did get the better of me and I left him behind. I’m quickly running out of room to display my Joes and Transformers so I really shouldn’t be padding my man cave with silly novelty items like this guy. Finding this guy in my stocking a couple of months later was a pleasant surprise. This is exactly the kind of thing I like to get in my stocking, something fun and stupid. When we were kids, sharing a bedroom, Doug and I would creep out of bed on Christmas morning and retrieve our stockings as early as possible, like 4am. We would tiptoe back downstairs to our room and spend the next couple of hours just enjoying our stockings until the hour came when we were allowed to wake up our parents and begin tackling the serious presents under the tree. There was always an orange in the toe of my stocking (which I never ate) and there were a few sensible items like toothpaste and shampoo in there as well. As far as goodies go, candy canes, marshmallow Santas, and After Eights were all essential. There was usually a magazine, WWF maybe, then SPIN and Transworld Skateboarding in later years. It was not uncommon to get a frustrating puzzle of some sort like a Rubik’s Cube. All of this stuff was great but the stocking toys were the best. Sometimes G.I. Joes would sneak into our stockings but often times it was was just something silly and random. You can’t get much more silly and random than a man made of bacon so Santa did well this year at capturing that nostalgic Christmas vibe. I was curious to see if there was any history to this figure so I googled “Archie McPhee” the name on the package and discovered they’re a very large novelty company that make all kinds of those weird little things that I loved as a kid like monster finger puppets and rubber chickens. 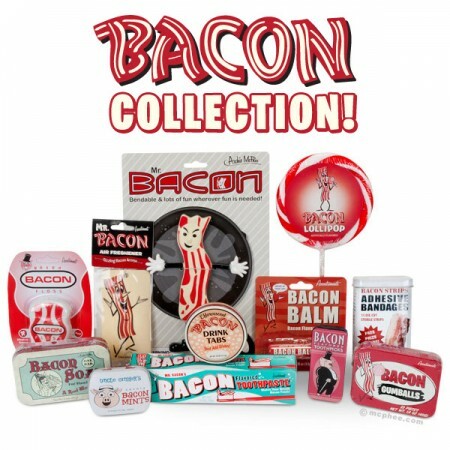 They actually have a full line of Mr. Bacon products so head on over to the site if you have a bacon aficionado in your life. 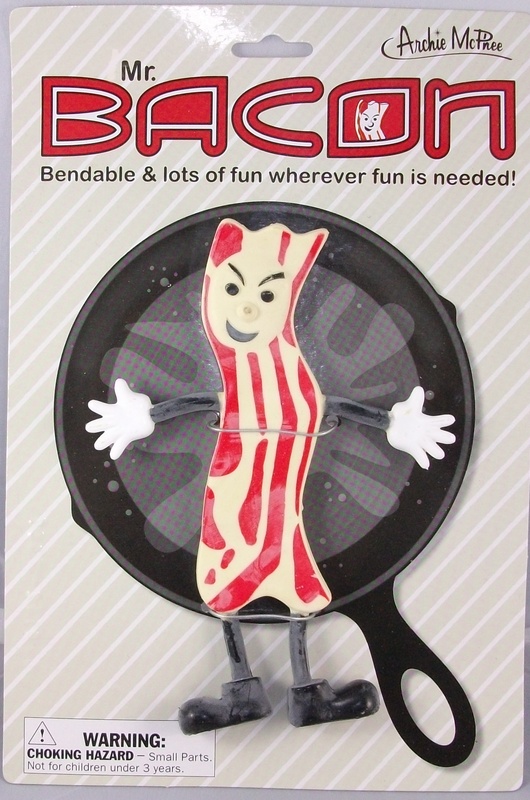 I don’t have much to say about the toy itself, it’s bendy, it’s cute, it’s bacon. Generally I like my bacon crispier than this guy appears to be but I won’t hold that against him. 4 out of 10. Posted on January 26, 2013, in Miscellaneous and tagged Action Figure, Review, Toy. Bookmark the permalink. 3 Comments. Had supper a little while ago. And now I need some bacon. Nice snack to go along with watching The Six Million Dollar Man. MMMMMMMMM Bacon. Bacon is perfect for any meal and any occasion. I don’t care for ham though. odd?